The Catholic Church is no stranger to diplomacy. Indeed since its formation the Church has been at the forefront of diplomatic activity, firs in Europe and then around the world. Popes often served as arbiters in European conflicts while Papal legates served as ambassadors to foreign courts. Even the first foreign ministry was founded by a Cardinal of the Church, the French Cardinal Richelieu. In a 2007 review of Papal diplomacy, the Economist wrote that despite the “march of secularism”, The Vatican’s role in world affairs has only expanded as it now has official relations with some 174 other states. In addition, the Holy See is an observer in 16 multi-lateral international bodies including the United Nations, the African Union and the OAS (Organization of the American States). If the 20th century saw an expansion of Papal diplomacy, the 21st century saw its digitization. The Holy See’s foreign office, the Secretariat of State, is on twitter as are the Holy See’s mission to the UN in New York and Holy See’s Press Office. Yet most importantly, Pope Francis himself is active on twitter. According to the recent Twiplomacy study, the Pope is the second most popular world leader on social media attracting a total of 19 million followers to his nine twitter accounts. In recent months, the Pope has used twitter in order to bring attention to wide array of issues ranging from the plight of Christians in war torn Iraq to the ability of sports to bring mankind together. 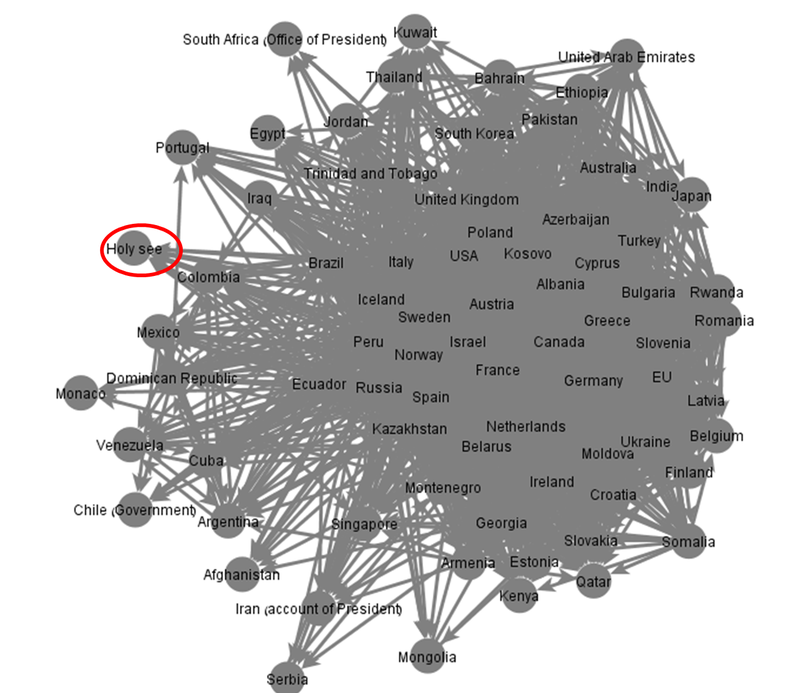 A networked model of Papal diplomacy? Its (the Holy See) diplomatic service is “just like any foreign service, with different people having different abilities. But they have an advantage: they are highly cultured. They know languages. They know history. They are very well-informed.” A former papal envoy to a war-torn nation tells with pride how the American embassy would send a diplomat each morning to ask him about the war zones, knowing the pope’s man would have been fully briefed by local nuns. Currently, we may be witnessing the rise of social networked diplomacy. That is information networks comprised of diplomats and diplomatic institutions which are based on social media sites such as twitter or Facebook. This week I wanted to examine if the digitization of Papal diplomacy is also evident in diplomatic social networks. 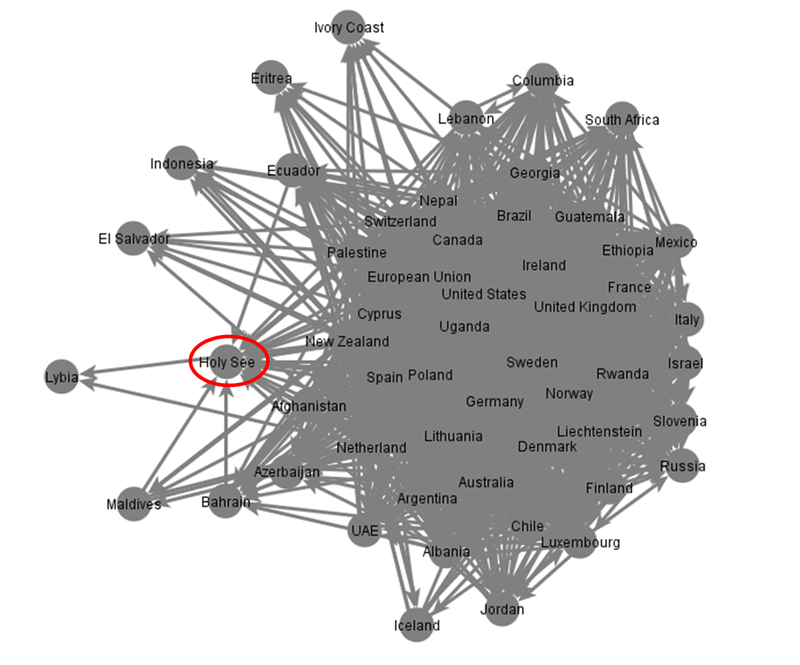 Several months ago I analyzed the social network of world leaders on twitter. Based on a sample of 42 leaders, my results indicated that world leaders have yet to form a close social network. In fact, the average world leader was found to be followed by just 4 of his peers. This week I added Pope Francis to this social network. Interestingly, the Pope is the fifth most followed world leader among his peers coming ahead of France’s President Holland, India’s Modi and other influential world leaders and Twitteratis. However, the Pope does not follow any world leaders in return nor does he serve as an information hub for world leaders. The image below locates Pope Francis in the social network of world leaders while the table below lists the ten most followed world leaders by their peers on twitter. When exploring the social network of missions to the UN in New York, I found that such missions form a dense information social network. I also found a form of social media mobility as UN missions from relatively small nations are very popular among their peers. This week I added the Holy See’s mission to the UN to this network. Results indicate that unlike the Pope, the Holy See’s mission has yet to attract a large following. In fact, it is followed by only 23 of its peers which is below the average of 26. It terms of its popularity ranking, the Holy See’s mission comes in at number 20 out of a sample of 55 UN missions. Finally, the Hole See’s mission does not follow any of its peers in New York. The peripheral location of the Holy See’s mission can be seen in the image below. As is the case with its mission to the UN, the Holy See’s foreign ministry does not attract many of its peers. Out of a sample of 77 foreign ministries, the Secretariat of State is one of the least popular MFAs attracting only 10 of its peers which is well below the average of 27. It terms of popularity ranking, the Papal foreign ministry comes in at number 68 out of 77 MFAs in the sample. In addition, like the Mission to the UN, the Secretariat of State does not follow any other MFAs. Thus, it does not serve as an important hub of information for other MFAs. Interestingly, no African MFAs follow the Secretariat of State which is surprising given the Church’s standing and numerous diplomatic activities across Africa. 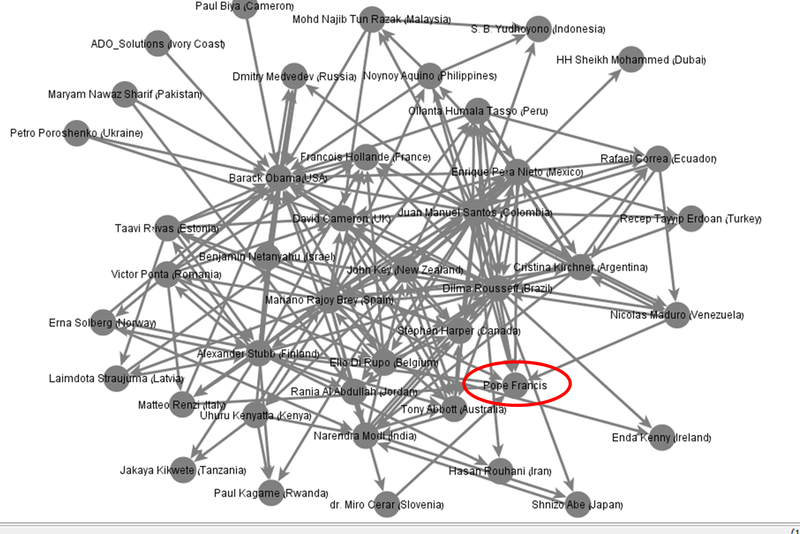 The image below demonstrates the rather peripheral location of the Papal MFA in the social network of foreign ministries. Posted in Uncategorized and tagged Digital Diplomacy, diplomacy, Foreign Ministries, Holy See, MFA, Network Diplomacy, Papal diplomacy, Pope Francis, UN, united nations. Bookmark the permalink.